HRH Prince Charles has been spoiling us rotten with his support for eco-fashion this month. Besides hosting the British Fashion Council's first-ever sustainable fashion show—part of London Fashion Week, naturally—his 10-day "Garden Party To Make a Difference" was also ground zero for upcycling hijinks from the likes of Gary Harvey, From Somewhere, and Junky Styling. 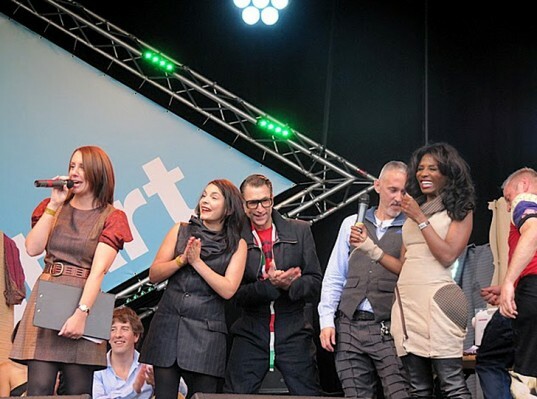 British upcycling powerhouses From Somewhere and Junky Styling took their friendly rivalry onstage when they were both charged to design an outfit for ’80s pop sensation Sinitta at The Prince of Wales’ “A Garden Party to Make a Difference”. The challenge: To make a new dress for Sinitta in one hour using items from her closet that she didn’t care for anymore. From Somewhere was handed Sinitta’s old Speedo swimsuits, while Junky Styling had to wrangle with a dated linen suit that the singer wore on the cover of Toy Boy. Of course, both fashion labels are no strangers to making couture out of other people’s castoffs. From Somewhere upcycles pre-consumer waste from the factory floors of luxury fashion houses, while Junky Styling regular conducts “wardrobe surgery” with rescued clothing. The event was organized by NOI Collective (“noi” means “us” in Italian), the group of inspiring ladies behind the “12 Degrees of Fashion” exhibit that began last September: entrepreneur/film producer Livia Firth, journalist/tv presenter Lucy Siegle, designer/Esethica founder Orsola de Castro, and stylist/eco-fabric specialist Jocelyn Whipple. Its not a separate industry - its an incredibly important new movement within the existing format - its about addressing the reality that is the fashion industry and challenging it/ meeting it where it is - otherwise its like having your head in the sand. From Somewhere and Junky Styling went head to head at a live challenge hosted by journalist and TV presenter Lucy Siegle. While the designers worked on outfits for the '80s pop singer Sinitta, Siegle introduced us to some of the most exciting upcylers in London: Gary Harvey, Christopher Raeburn, Dr. Noki, and Traid Remade. The stage was a hive of activity. Highlights included journalist John Paul Flintoff relating a tale of how he made his own jeans on a pedal-powered Singer machine at a bus stop, model Erin O'Connor donning a dress that Harvey whipped up in 20 minutes, and a first look at O'Connor's new organic T-shirt collection, "She Died of Beauty." Even the stage decor at the show, which was produced by Ethical Fashion Forum founder El Lasker, was upcycled. British designer Giles Miller custom-built furniture for the event out of recycled cardboard. From Somewhere's Orsola de Castro draped Sinitta in a gown cobbled together from the singer's old swimsuits, no doubt inspired by From Somewhere's current collaboration with Speedo. 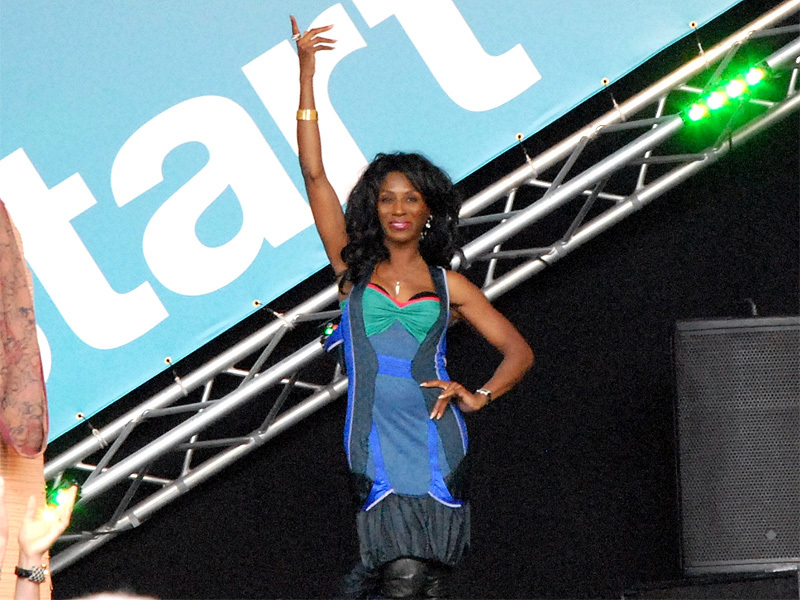 Kerry Seager from Junky Styling made a dress using the suit Sinitta wore on her Toy Boy record cover. The shoulder pads from the original garment were transformed into removable hip embellishments. Afterward, NOI Collective's Red Cross Tent was the scene of many an upcycling workshop, featuring sustainable fashion labels such as Lu Flux, Enamore, and THTC. One of the activities was this "Grow Your Dress," composed of fabric donated by some of the hottest designer fashion houses in London.